We’d love your help. Let us know what’s wrong with this preview of Mask of the Pirate Queen by Katrina Ostrander. 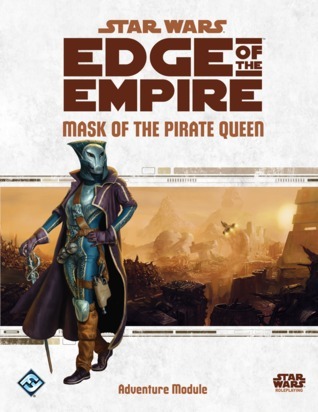 Pursue a criminal mastermind across the galaxy in Mask of the Pirate Queen, an adventure for the Star Wars®: Edge of the Empire™ roleplaying game! A powerful smuggling operation has placed a tremendous bounty on the head of the so-called Pirate Queen. In hunting this bounty you and your colleagues will explore the prosperous shadowport of Ord Mantell, fight an intense inte Pursue a criminal mastermind across the galaxy in Mask of the Pirate Queen, an adventure for the Star Wars®: Edge of the Empire™ roleplaying game! A powerful smuggling operation has placed a tremendous bounty on the head of the so-called Pirate Queen. In hunting this bounty you and your colleagues will explore the prosperous shadowport of Ord Mantell, fight an intense interstellar fleet battle, and discover the dangerous underworld sport of pit fighting. You never know where you’ll find the Pirate Queen– or what you might encounter in the search. To ask other readers questions about Mask of the Pirate Queen, please sign up. - As of writing I have GM'd the first two out of three parts of the campaign. - This is the first time I've GM'd and therefore it's the first time I've used one of the campaign books, so I don't have a frame of reference for comparing this type of material. The majority of the story is predictable, with a few twists that, if pulled off well, are interesting. My main complaint is that the book sets up a lot of interesting choices and potential hooks but then doesn't actually develop or provide information for those (more interesting) player choices. The maps are good, though when they decide to provide them and when they don't thoroughly baffles me. The encounter design leaves a lot to be desired. The planet of Saleucami is very interesting and I can foresee going back there, but not really because it was well developed in this book. On the other hand, the information about Ord Mantell was much more thorough so if a GM wanted to return to that planet this book provides a lot of information on its different districts. I should note that I'm running this with a modified goal since my group of PCs are not bounty hunters but members of the Rebellion, which has caused some issues but since the only goal given for doing this campaign is money, modifying it is the only way to get my group interested. I am looking forward to bringing back at least three of the characters encountered in this campaign. In this adventure you get hired by a consortium of gangsters to capture/kill the elusive pirate queen. Some encounters in the players' investigation to find the pirate queen could work really well: some memorable characters and a few moral dilemma's that could haunt the players. This time, Fantasy Flight provided maps for the pirates' lair and the pirate flagship which is an improvement.